Home » Reviews » Jack of All Trades? A Review of the Safety 1st Continuum 3-in-1 Convertible. Jack of All Trades? 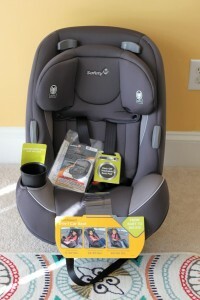 A Review of the Safety 1st Continuum 3-in-1 Convertible. Out of the box glory! 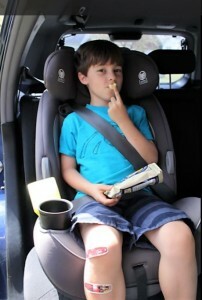 Remember back in the day when our choices for birth to booster seats were very limited, and quite frankly, pretty awful? It’s totally amazing how much has changed, and how many choices we have regardless of budget and scenario. Dorel/Safety 1st has released several of these budget-friendly seats and the Continuum is one of them. It’s basically a budget version of the Safety 1st Grow and Go Convertible with slightly lower height/weight limits. You can buy the Safety 1st Continuum for less than $120! Let’s get to the basics first before touching on the more juicy details. 10 year life span before expiration! The Continuum had references to extended rear facing all over it’s manual and does not allow kids under 2 to forward face in this seat. Continuum has 3 recline positions. For babies who cannot sit upright without support, the level line on shell must be parallel with the ground. 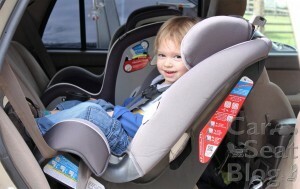 For older babies and toddlers you may use recline position 2 or 3 on the base and the seat can be installed rear-facing at a more upright angle. For forward-facing and booster mode you must place the seat in the fully upright (#1) position. Installing the Continuum was fairly straight forward with both seat belt and LATCH. I installed it in both my husband’s 2000 Toyota 4Runner and my 2005 Honda CR-V. The belt path for a seat belt install was roomy enough for me to get my hand in, but I can see someone who doesn’t have the slender monkey arms that I do having a bit more difficult time reaching in. The cover pulls back conveniently and this helps immensely in the installation process, especially when using LATCH. The Continuum fit like a puzzle piece in the backseat of my CR-V. The flat seats and 90 degree seatbacks cradled the Continuum perfectly. However, in the 4Runner I did have some gaps between both the bottom of the base and the vehicle seat and the back of the car seat and the vehicle seat when installed forward facing. The seats are fairly sloped and the Continuum just didn’t want to sit flush at first, but once I placed pressure on the car seat and had it installed properly, the gaps weren’t as apparent and didn’t hinder me from getting a tight install. This seat does not have a built in lock off, so if your seatbelts do not lock you must use a locking clip. Great fit in the 90 degree seats of a CR-V.
As mentioned earlier, LATCH installation was easy and straight forward, and when not in use the LATCH connectors have a place to be stored safely away. 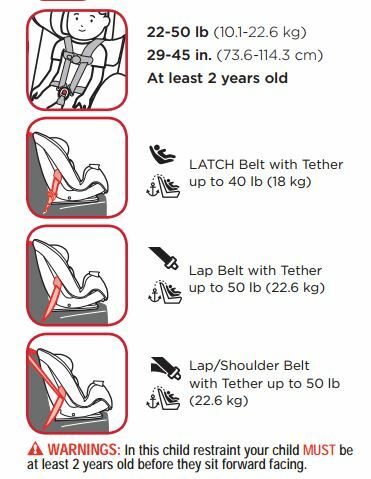 Safety 1st defers to the vehicle manual for LATCH anchor use and locations but does state that the lower anchors cannot be used for children weighing more than 40 lbs. Children between 40-50 lbs. using the harness must have the seat installed with a seatbelt and tether. 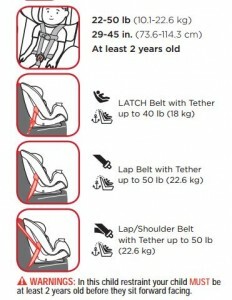 The tether must be used when the seat is installed forward-facing using the 5-pt harness. 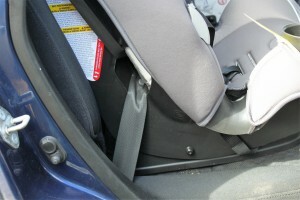 Installation with inflatable seatbelts found in some Ford, Lincoln and Mercedes vehicles is NOT allowed. The Continuum is designed to fit infants through booster age children. Its no-rethread harness with adjustable headrest makes it easy to adjust the fit to your child. I had no issues at all pulling the levers and raising/lowering the headrest and harness. However, for the tiniest passengers, the Continuum must be adjusted differently. Newborns and small babies: When using the lowest harness slots for smaller infants, you MUST use the body pillow insert and the headrest MUST be placed in the lowest position. 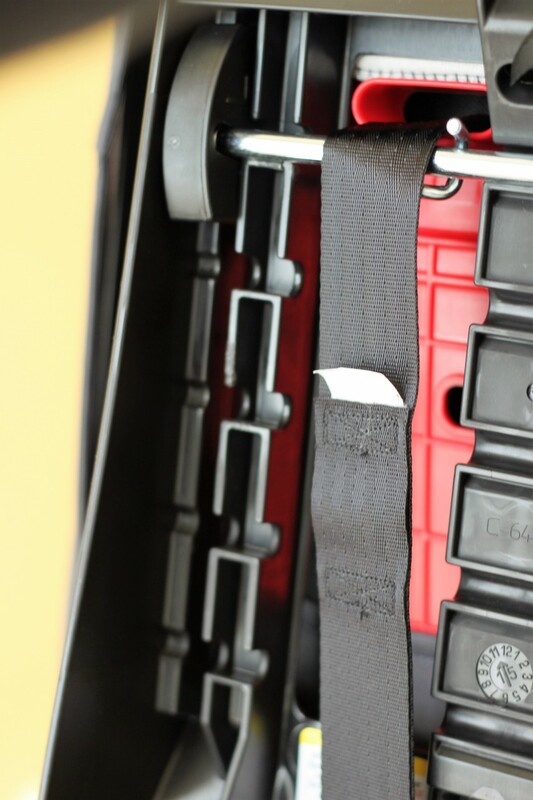 To use the lowest harness slots, it’s a process of undoing the harness from the splitter plate and then rethreading it through the cover, the slots in the seat, and this red plastic piece on the back of the seat. The instructions put emphasis on making sure you place the straps UNDER the metal bar on the back as opposed to over the metal bar when using other harness slots, and I can see this being missed if not reading the manual or labels thoroughly. There are loops at the end of the harness straps- the first for when using the lowest harness slots and the second for when using the others. 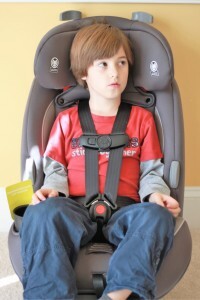 This allows the harness to pull snug enough over infants. Setting it up for a small baby was a bit challenging, but it’s smooth sailing with all other settings. Harness straps threaded through the lowest slots for infants. Must go OVER the metal bar for no-rethread harness mode. 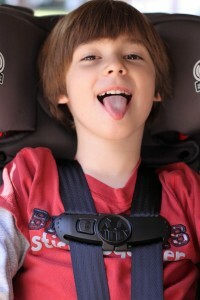 Another thing I noticed was the harness straps fit very close to the necks of my kids. My 23lb 34in 2 year old didn’t seem to care but my 48lb 46in 5 year old was very annoyed and said they hurt and cut into him. He’s not particularly large for his age and he was right at the highest harness slots. 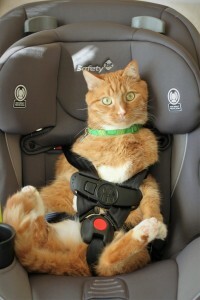 He seemed crammed in the seat and it just wasn’t comfortable to him in harness mode. He’s not quite ready to sit in a booster at this time so this seat kind of hits him in an awkward transition period. For reference, he fits great still with plenty of room in his other harnessed seats, which are combination seats – not convertibles. The harness is just a smidge above his shoulders although the cover makes it look deceiving in this photo. He complains the straps cut into his neck. 48lbs and 43 inches at 5 years old. He fits, but without growing room! 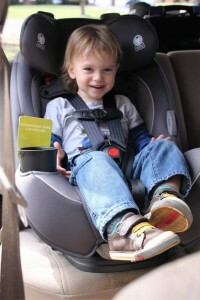 The seat fit my petite 2 year old very well both in forward and rear facing mode and he had no complaints. Declan does not ride forward facing but he does meet the 2 year old minimum requirements for forward facing in this seat. The straps do rub his neck but he did not complain about them. My friend’s 12lb 10 week old, Aspyn, tried out the seat as well. I try not to make my friends’ kids cry on a regular basis so I stopped tightening her harness when she got mad at me, but you can get a general idea of how she fits in the seat. Note that the harness isn’t as snug as it needs to be if actually in a vehicle but you can see that she fits well and the harness slots are just a hair below her shoulders (the cover is a bit deceiving in photos but the harness straps actually do go down behind her). The headrest is in the lowest position. Give her harness a tug and pull the chest clip up a bit and she’d be good to go! 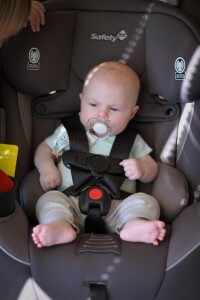 I can’t see this seat fitting a tiny baby smaller than her due to the position of the lowest harness slots. The manual specifically says to not use this seat if the slots are above an infant’s shoulders and it was pretty close on Aspyn. 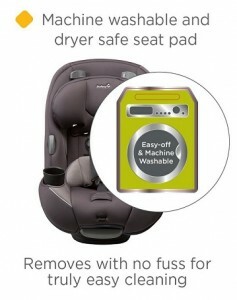 It also states that the infant insert must be used when using the lowest slot position. It definitely would not have fit her at birth despite her meeting the weight requirements. However I realize all babies come with different torso heights so it’s going to depend on the newborn. 10 week old Aspyn. Please note the harness needs to be tightened and chest clip moved up if we were actually in a vehicle. Aspyn was totally over my photo shoot and not in the mood for harness tightening while in the living room! In booster mode it fit my 5 year old fairly well. The lap belt was over his hips and the shoulder belt fit nicely across his chest and away from his neck. There is a shoulder belt guide that is optional to use depending on how your shoulder belt fits across the seat. I did not have to use them and found that in the 4Runner it actually brought the shoulder belt closer to his neck than I would like. It didn’t make a difference in fit in my CR-V. However, the headrest/belt guide was already at the highest setting so I would need to buy another booster for him in the near future if using this for him. It is a bit bulkier than dedicated booster seats, but I actually like that. It felt very solid and although it wouldn’t last long for him, he said it was comfortable. Pirate Booty mustache is optional when using in booster mode. A neat thing about the booster mode in this seat is that you don’t need to remove the harness. There is a red plastic piece on the back of the seat under the cover that you simply tuck the harness behind. The crotch buckle does need to be removed in booster mode. 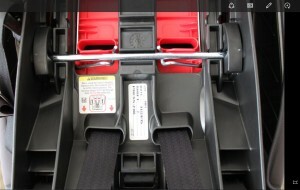 The manual states that the LATCH attachments should be stored and not used when the seat is being used as a booster. That’s unfortunate because many parents and caregivers prefer to secure their booster seats with LATCH attachments so they can’t be projectiles if they are unoccupied and otherwise unsecured. The cover is easy to remove thanks to snaps and you don’t have to detach the harness straps to get the cover off. The cover is machine washable and can also go in the dryer! Machine wash all pieces of cover separately with cold water on a gentle cycle. Do not use bleach. Tumble dry separately for 10-12 minutes on low heat. Remove immediately. The cup holder is removable and dishwasher safe. Cleaning Harness Straps: Spot clean using warm sudsy water and damp cloth. Love love love the 2 year minimum for forward facing!! 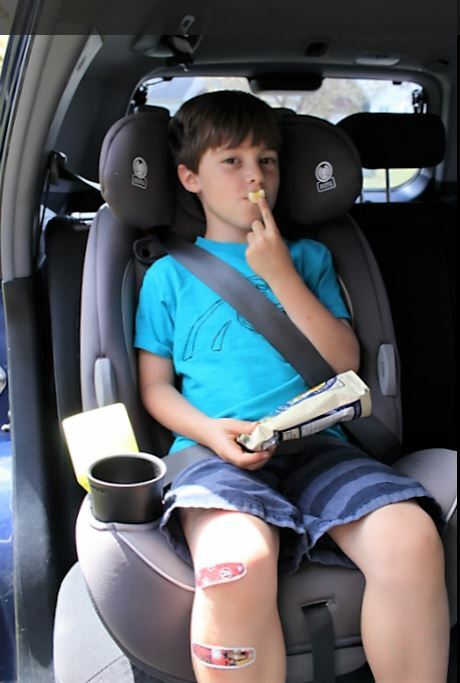 Won’t be the last seat your kid will need since it won’t fit most kids until they can pass the 5-Step Test and safely transition to adult seatbelt. 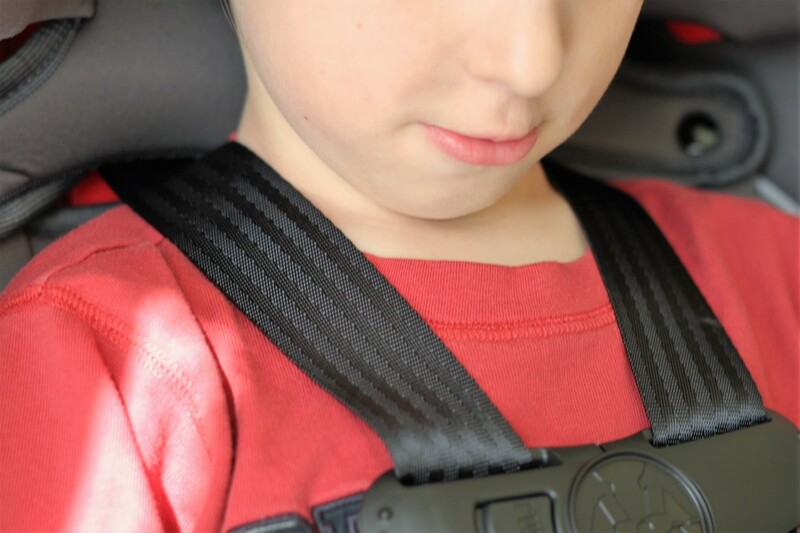 The Safety 1st Continuum is a great, budget-friendly option for many families. While I didn’t find it to be a perfect fit for a tiny newborn or taller kids in booster mode, it fits the wide span of in between and does it well. 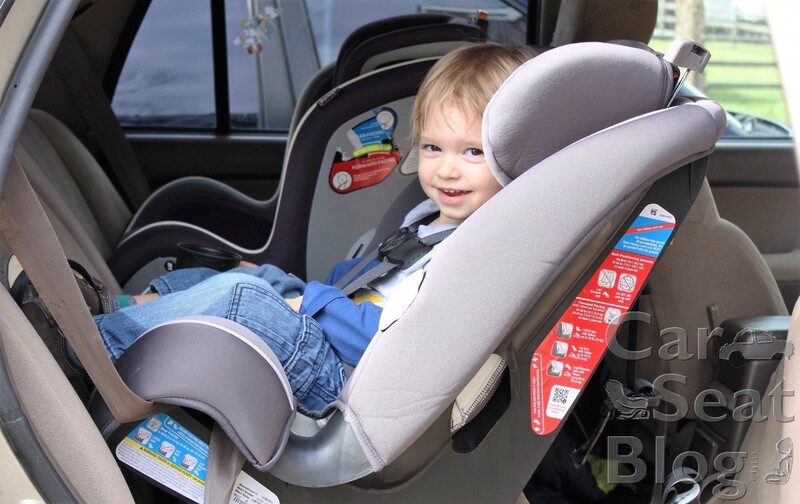 It’s an easy to use seat, makes a great convertible, and is nicely padded and comfortable. Unfortunately I cannot recommend this seat for orange tomcats. Crispy seems to be lacking shoulders, which hinders a proper fit. Sorry Crispy. Thanks to Safety 1st for providing this review sample. No other compensation was provided and the opinions expressed in this review are entirely my own. Any idea how well two of these would fit next to each other? I have twins and I am trying to find affordable seats that are slim enough to put side by side in our minivan. I love the cat pic! It brings back memories of Marvin. Oh my gosh, that cat takes the cake! How did you find pulling the harness tight? I’ve had some folks complain the grow and go was very difficult, wondering if you had a problem? We have a Safety 1st Guide 65, the harness is pretty easy to tighten. Looks like a nice budget seat as far as luxury features. Thanks!